The study explores ground-level realities linked with initiatives on tax administration, construction permits, transparency, compliance with environmental and labour laws and regulations, and inspection reforms. For this NCAER undertook two special purpose surveys covering state-level officials and firms. The firm survey covers 600 enterprises, 50 each in the 12 selected states, Andhra Pradesh, Delhi, Gujarat, Haryana, Karnataka, Kerala, Madhya Pradesh, Maharashtra, Punjab, Rajasthan, Telangana, and Tripura. The state-officials survey covers associated government departments in the 12 surveyed states. 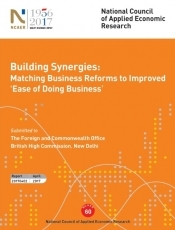 The major purpose of this study is to provide policy makers and investors real-time feedback on the level of awareness and effectiveness of the business reforms that are being implemented across the states, and highlighting the areas where further work needs to be carried out in order to ensure that the reform process serves the needs of the intended end-user, the firms.